A big influence on how I came to view formations was through Lee Ufan and latterly, as a global counterpoint, Agnes Martin. Both sought to reject the representational image and certainly in Lee’s case, bring the viewer “…at this starting point of experience.” (Blackwood, 2012). Lee has fused Western philosophy and abstraction into contemporary Korean ink painting, while Martin’s interest in Taoism and Zen Buddhism places a new intention on grid and line formations compared to Constructivist and Abstract artists, such as Piet Mondrian, who through the use of the domestic space also provides inspiration for living with the way he creates. Firstly I identify a place of light and shadow encounter, I then position a placeholder in a loosely anticipated area on the wall. The placeholder, a sheet of A4 paper mounted on the wall is for me a symbol of a standardised form. As Nicolas Bourriaud says “The frame is at once a marker - an index that points to what should be looked at - and a boundary that prevents the framed object from lapsing into instability and abstraction…” (Bourriaud, 2002, p.41). The arrangement of paper (in this case two sheets) is based on the encounter of the space. During the interaction between the placeholders and the light and shadow I will observe the transience formations, photographing encounters which to me are reflective of a “dynamic unity” (Kepes, 1944/2012, p.30) within the ‘image space’. Of course, the search for a dynamic unity is subjective to the projections within the operators selection process. Each abstract I attempt is an individual moment of light experienced in the space. The result being an incomplete arrangement of experiences that recognises “The desire of representation exists only insofar as it can never be fulfilled, insofar as the original is always deferred.” (Crimp, 1993, p.111). I select and print one of the shadowgrams from each placeholder to a 1:1 scale and document its return to its place of creation. 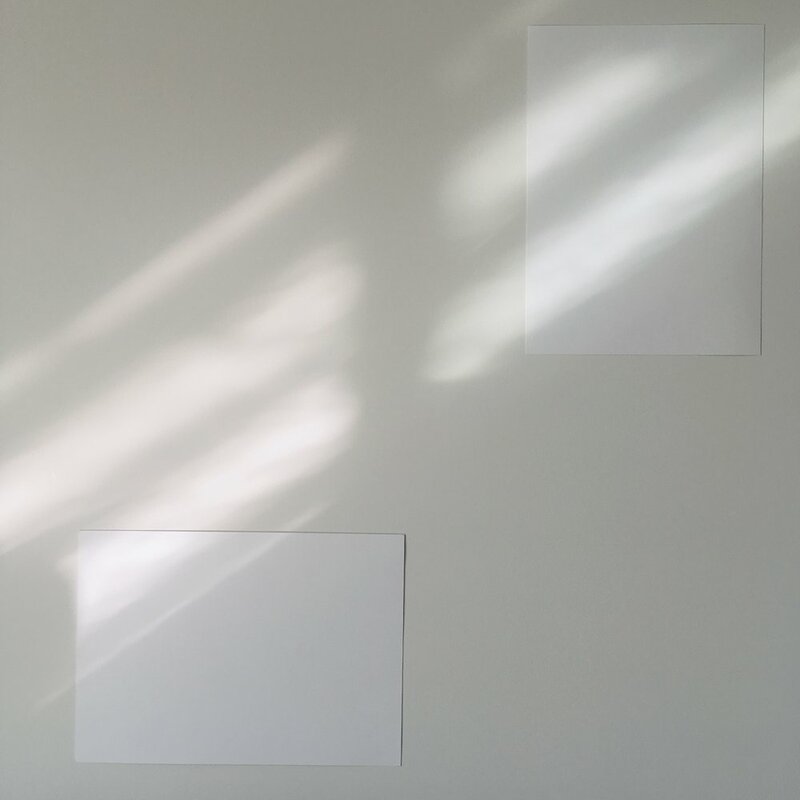 The space between the abstracts (the white wall) provide what is referred to in Japanese as Ma, which without a conclusive translation in English could be considered as a pause/gap/interval (Campany, 2018). The desire I have is for the viewer to use this space in-between to imagine the abstractions expansion out of the image space and consider themselves how this experience may have come to pass; thus creating a dialogue. In embracing the limits of the still-image, the acknowledgement of incompleteness becomes useful. 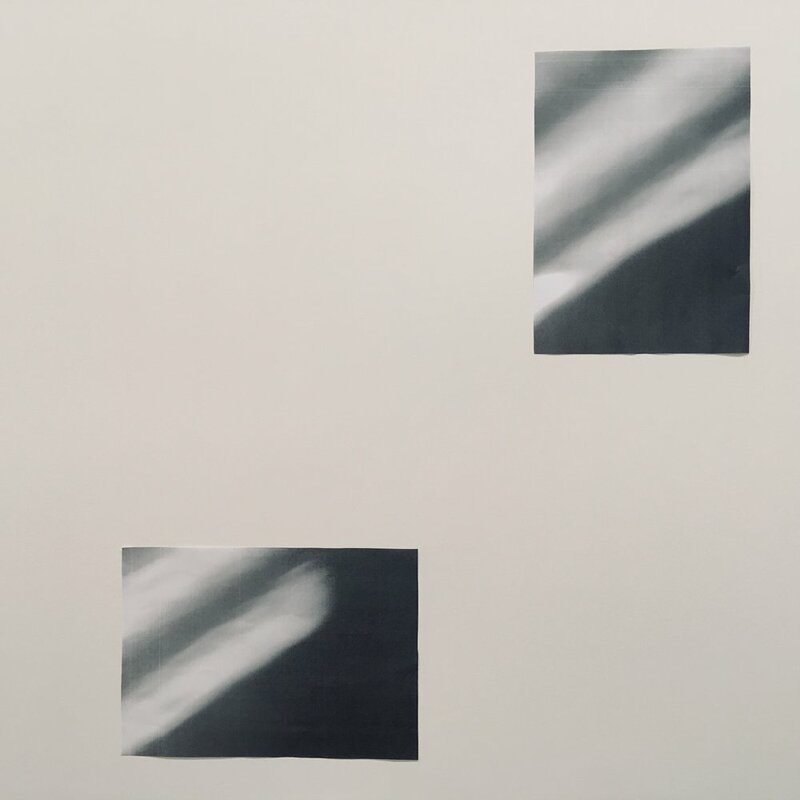 Campany describes this by saying “Ma recognises that this negative space may not be physically real, but it is psychically real, playing an active part in the observer’s understanding of themselves and what they observe. The greater the intensity of seeing, the more palpable this experience of ma, and this can be translated via the image for the viewer.” (Campany, 2018). Depending on how Ma is subsequently organised by me or the spectator, a new compositional abstract can be formed, or like above the place of creation is contextualised by its position in a relatable space. In doing so, Bourriaud’s quote on framing is inverted, and as such we can understand the statement "Outside and inside are both intimate-they are always ready to be reversed, to exchange their hostility." (Bachelard, 1958/2014, p.233). Or alternatively as seen above, the mosaic can act as a sundial or ritual experience, aligning the spatial-temporal experience of mine with the showtimes of today. Either way, the spectator has the opportunity to participate in forming their own experience of the space, documenting their presence and “thereby privileging the spectator instead of the artist.” (Crimp, 1993, p.98). At the beginning of the course I wrote in my artist statement about the influence of Asian culture, Western abstraction and experiential sculpture, together with an engagement in site-specificity. The resulting ideas in this assignment of shadowgram formations are a hybridism of these influences, creating a formation in their own right. In A1 I described shadow and surface as a ‘time restricted street art’. Having now used A2 to develop my abstract technique, along with this assignment explaining the process in the domestic space as a way of seeing, and living; I see the role of A4 to potentially take this strategy back in the public space. Each encounter will be ephemeral and site-specific due to its spatial and temporal conditions, but will maintain a certain continuity due to the strategy or ‘rules of the game’. In creating a game that relies on its spatial-temporal existence, it can also become a democratic activity to promote ‘shared experience’ in the understanding of how photography works as a method of both art and document. Bachelard, G (1958/2014) The Poetics of Space. New York: Penguin. Bourriaud, N (2002) Relational Aesthetics. Paris: Presses du Réel. Bourriaud, N (2002) Postproduction. New York: Lukas & Sternberg. Kepes, G (1944/2012) Language of Vision. USA: Literary Licensing, LLC.